The Yips: Is there a cure? Just the word strikes fear into many golfers. Statistically speaking, 33% of golfers will experience the yips in some form, during their golfing career. Previous victims include the great Sam Snead, Arnold Palmer, Tom Watson, and Bernhard Langer, to name a few. Bearing in mind one in three of you reading this will experience the yips at some point. We best find out – what are the yips and if there is a cure? The yips – what are they? The yips are often classed as a psychological phenomena affecting golfers’ chipping and putting actions. 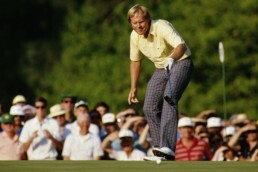 They most commonly affect short putts: ranging from two to five feet in length. The yips’ have a severe impact – unwanted twitches, jerks and sometimes freezing over short chips and putts. This leads to unthinkable results. 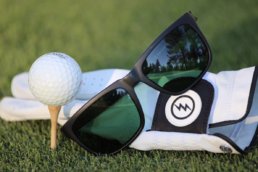 It can make the most experienced tour professional look like a bumbling beginner. When we break down the yips we can better understand what is going on. Research into the yips has shown four key changes to the biomechanics of how we putt. 1) Increased muscle activity (tension) in their forearms. 2) Increased grip force applied to the putter grip. 3) Increased variability in wrist flexion/extension during putting. 4) Greater putter face rotation through their putting stroke. I’ve placed the points above into a logical order. Hopefully, you can see a clear link flowing through these changes. The yips are frequently described as a psychological condition. However, scientists are yet to find a factor, or set of factors, that predicts who will get the yips. Both heart rate measures and anxiety questionnaires cannot explain who will fall foul. The closest we can come to answering this question is to understand how golfers think when they fail under pressure. A common trend is for golfers to reinvest attention back into their movements. Naturally we don’t think about how we control movements. Do you ever think about how you walk or pick up a cup? Probably not, and yet in golf we love to intensely focus on how parts of our body are moving during our swing. This re-investment of attention back into our movements tends to disrupt our body’s wonderful ability to self-organise movement. Hence we have the phrase – ‘paralysis via analysis’. Over-thinking our movements may explain why we see people who have one ‘yip’ hit a downward spiral. One error leads to us thinking more about our movement. The more we think about our movement, the more likely it is to happen again. The yips – Is there a cure? Now for the important bit, how do we cure them? It’s tough and takes some clever practice, but it can be done. Here is how. The first rule about the yips, is that there is no such thing as the yips. Most golfers are very black and white in their diagnosis – ‘I have or I don’t have the yips’. Instead, analyse your putting or chipping on a continuum – Lots of unwanted tension, grip pressure and unwanted wrist action, all the way down to minimal unwanted tension, grip pressure and wrist action. Your aim is simply to shift your technique towards the latter end of this continuum. Even elite tour pros have shots where they experience unwanted tension, wrist action and error. However, these changes in elite players are so minimal, and so infrequent that we assume they are perfect machines. Your aim is to move towards the same bandwidth of error as these great performers. Practice is the biggest stumbling block for golfers trying to improve their yips. You do need to improve your technique, but the more you think about your movements, the more likely it is you will never full rectify the fault. The trick is to break down your practice into two separate blocks. One block of practice should focus on swing changes. The second block should focus on focus of attention and golfing performance. We cover these concepts briefly below, but for more detail on these types of practice check out this article. The clue is in the name. Focus on your movements, not the outcome. Head to the putting green but pay little attention to where your shots finish. Your aim is to make putting strokes with far less tension in your arms, and less grip force. Hold your follow through and assess your wrist angle. If your wrists have been over-active correct them. The culprit for the yips is commonly the dominant (trail) hand. By making putting strokes just with your non-dominant (lead) hand, you will make swift progress. Then you can slowly re-introduce your troublesome hand, with minimal contact on the putter grip. I’ve found this approach works fantastically. Alongside improving your technique, you need to improve your though process. Research suggests thinking about your target, rather than your technique allows you to perform better under pressure. 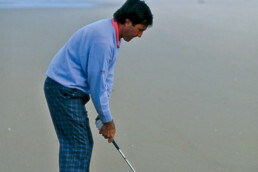 For this practice, find a straight two to five feet putt. Place a tee peg directly behind the centre of the hole as a target. Now, hit 20 putts towards the tee peg. The tee peg should be taking up your entire focus whilst putting. Record your putts holed out of 20 and note it down. Next to this score, rate your focus on the target on a scale of 1-10. Over the coming weeks repeat this practice and see your thought process and scores progress. Once you hit the magical 20 putts holed out of 20 mix things up. Add an extra foot onto your putts, or add in breaking short putts. Overtime keep track of how your technique and attentional focus is progressing. Your one aim is to make more swings with great mechanics and a focus on your target, rather than cure the yips. Your poor putts will go from one in ten, to one in 100, 1,000 to 1 in 1,000,000. You’re never looking for a cure, as there is no such a thing as ‘the yips’ is there? Will Shaw is a performance coach to elite golfers and a lecturer in sports biomechanics and psychology.